People breaking red lights and not paying attention are two of the main reasons for near-misses. File photo of a Luas tram in Dublin city centre. LUAS DRIVERS HAVE had to apply the emergency brakes 550 times to date in 2018. Most of these incidents were due to motorist behaviour such as breaking red lights or engaging in ‘swept path infringements’ (getting too close when the tram is turning) (266) and pedestrians suddenly entering the tramway (223), while 61 incidents were due to cyclists breaking red lights or getting too close to the tram. A Luas spokesperson said there are more people travelling on the Luas than ever before but fewer incidents to date this year than in 2017. The emergency brakes were used 570 times last year – 321 times in relation to incidents involving motorists, 203 involving pedestrians and 46 involving cyclists. The total number of Luas journeys in 2018 to date amounts to 3.5 million km (1.8 million on the Red Line and 1.7 million on the Green Line), and 3.1 million in 2017 (1.8 million on the Red Line and 1.3 million on the Green Line). The spokesperson warned that phone-use means “near-misses with pedestrians are on the rise”. “Pedestrian behaviour, as observed by Luas drivers in recent years, is most interesting; earphones in, head down, and thumb firmly fixed on the screen. More and more people don’t even look up, yet alone look left and right. Commuters are distracted. Walking out in front of an oncoming tram is a common experience. They added that motorists are also at risk, noting Road Safety Authority research shows that drivers are four times more likely to be in a collision when using a mobile phone while driving. “This safety message is a reminder to pedestrians and motorists that it takes time for a tram to stop. The use of emergency brakes is not a pleasant experience for those on board. Think of the injury you could sustain as a pedestrian or the damage you could do to your car as a motorist. Even minor damages cost. Replacing phones cost. Email “'Was your Snapchat worth it? ': Emergency brakes used by Luas drivers 550 times this year ”. Feedback on “'Was your Snapchat worth it? 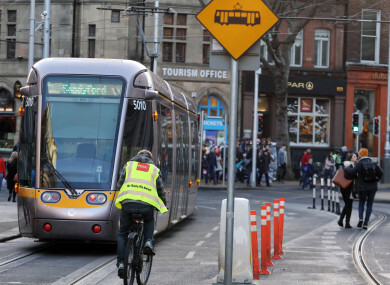 ': Emergency brakes used by Luas drivers 550 times this year ”.